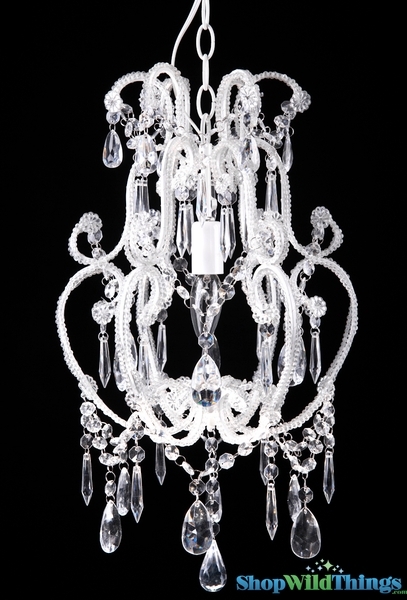 This sophisticated but girly chandelier is super elegant and has just the right amount of glitz and glam. Cordelia features 3 tiers gorgeous acrylic garland on her curly frame. She would be perfect above your fainting couch or vanity or office or more practical area. She has one bulb opening that requires a 40 watt chandelier light. This chandelier measures in at 18" long and 11.5" wide. 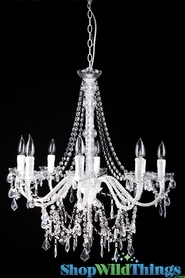 This acrylic chandelier comes ready to be hardwired by your electrician. It can also be fixed by an electrician to be used as a plug-in unit if you prefer. Your handyman (or woman) will need to connect wiring for you. A metal ceiling cap is included and attached to the chandelier. The Cordelia has a 25" hanging chain. 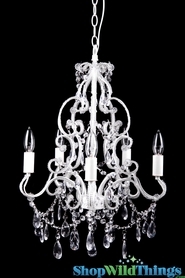 Chandelier Queen Elaine - Crystal - 26" x 28" x 25" - 8 Lights!